Since the beginning of 2016, Trading 212 has been proud to see its trading platform at the top position in the United Kingdom. And that comes as no surprise since it is quite an advanced platform with high performance for engaging in trading CFDs and Forex. The company incorporates the most up-to-date mobile and web technologies to guarantee quick and precise order execution across all versions of the platform. Trading 212 is not only easy to work with but it is also teeming with features that can live up to the expectations of even the most fastidious customers. The completely built in-house platform is frequently updated to accommodate customer feedback and to provide its avid users with optimal conditions for trading. 65 countries with more than 200,000 traders depend on Trading 212 to trade company stocks, currencies, gold and oil commodities, and indices. Besides that, investors derive advantage from a superb multilingual support centre accessible 24/5, countless trading instruments, guaranteed funds protection, a broad array of educational materials, and competitive spreads. Trading 212 is a trading name, part of Avus Capital U.K. Ltd. (strictly overseen by the FCA), Avus Capital Ltd. (Bulgaria’s Financial Supervision Commission is its regulator), and Avus Capital CY Ltd (CySEC is its regulatory entity). Trading 212 is jam-packed with financial instruments, including around 270 Forex pairs, 100 Stocks, and more than 20 Indices. In addition, investors can initiate trades in CFDs and Commodities. What is amazing about all these assets is that they are commission-free and spreads can be either floating or fixed. The AUD/CHF Forex currency, for instance, benefits from an incredibly low spread – as low as 0.001. The minimum size of the lot is capped at 0.1 pips while the max leverage is 200:1. Traders who have the intention to put their scalping strategies into place can do that thanks to a combination of an outstanding price accuracy and quick execution times. All markets close on Friday at 21:59 GMT and they re-open on Sunday at 22:01. Swaps are applied at 22:00 GMT for all open positions. Since there are no different account types, this means that the trading conditions enlisted above are similar for any trader that has opened an account with Trading 212. The Real account’s minimum deposit is £€100 or $150. Contingent upon the method of payment, a fee of 0.7% to 3.5% is applied. Withdrawals, save for bank transfers, are gratis. For those investors who would like to test the company’s software in advance, Trading 212 provides the handy option of a demo account with a balance of £/€10 000. Take note that the demo trading experience is almost the same as using the real account. A trading platform, entirely crafted in-house and fully web-based, is at traders’ disposal at Trading 212. The software bears diverse integrated characteristics and unique features and revolves around the provided financial instruments. Regular updates guarantee the usage of new indicators, tools, technical analysis instruments, and many other improvements. Opening a position’s execution time is almost instantaneous, making trading unbelievably accurate. The Trading 212 platform is fully flexible and is available for mobile devices with a quickly downloadable app both for iOS and Android users. Its functionality is very well detailed and documented on the company’s website. Trading 212 punches above its rivals’ security weight by being sternly monitored by three regulatory entities in three different entities – U.K.’s Financial Conduct Authority, Cyprus’ CySEC, and Bulgaria’s Financial Supervision Commission. The enterprise packs an additional security punch by maintaining customers’ cash in segregated accounts that are further shielded by the Investor Compensation Fund (ICF) and by the Financial Services Compensation Scheme (FSCS). If a default occurs, the compensation provided by FSCS is up to £50,000 while the ICF’s compensation is up to €20,000. Trading 212 is well-equipped with an excellent support centre that handles every query in a timely and professional manner, epitomising attentiveness and high levels of specialised knowledge of the financial markets. Reaching out to Trading 212 is possible through a live help option, via numerous fixed lines around the globe, through different e-mails, and also via a contact form on the website. The command operations are carried out from Cyprus and the United Kingdom while the website comes in English, German, Dutch, Spanish, Malay, Portuguese, Hungarian, Greek, Czech, Russian, Romanian, Arabic, Chinese, Turkish, Swedish, Serbian, French, Polish, Italian, and Norwegian. 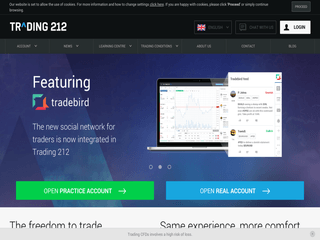 Trading 212 accepts a number of payment options, including credit and debit cards (VISA, Carte Bleue, MasterCard, VISA Electron, and Maestro), PayPal, Skrill, Bank Wire, Giropay, Mister Cash, SafetyPay, CashU, China UnionPay, and Direct eBanking. 10 minutes is the usual processing time for deposits via credit/debit cards while bank transfers necessitate between 2 and 3 working days. In accordance with the deposit method, different charges and fees are applied and they vary from 0.7% to 3.5% (don’t forget that your bank might charge you additionally). Third-party deposits at Trading 212 are strictly forbidden. Withdrawals are executed via the same options and they are exempt from fees except for a €5 bank fee. Note that your respective bank might additionally charge you for the transaction. Accounts can only be launched in USD, GBP, and EUR. Before any registration may take place, an ID verification is necessitated. The minimum account size is €100, but there is no maximum whatsoever. Opening more than 1 account is possible at Trading 212. Trading 212 is devoted to generously pampering its loyal customers. For this reason, it has designed the Trading 212 Rally contest which has a weekly prize of £15,000 and the prize pool is distributed among the top 100 players like this: The first place goes home with £2,000; the second place celebrates with £1,500; the third place gets £1,000; the fourth place obtains £600; the fifth place acquires £400; and all those who are from the 6th to the 100th place receive £100. To join this competitive contest, all your efforts should be focussed on launching a Free Practice Account and starting trading via the web or mobile application. The competition starts each Monday at 00:00 and terminates on Friday at 22:00.